Ang popular na social media personality at beterano na DDS Blogger, Mark Lopez ay nagsiwalat sa isang reposted statement ng ilang mga dahilan kung bakit ang Dengvaxia Tragedy ay hindi lamang tungkol sa pandarambong at kasakiman. 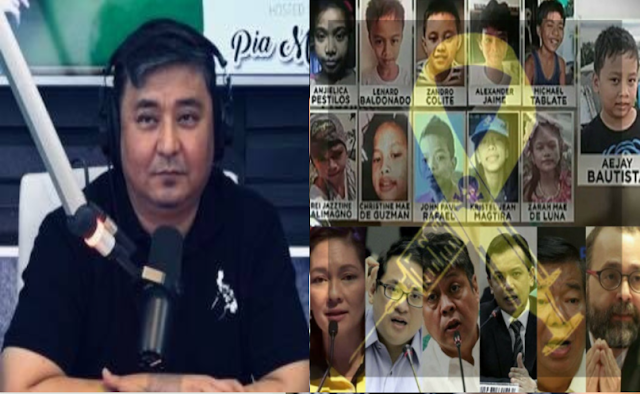 Sinabi ni Mark Lopez na ang Dengvaxia tragedy ay isang mapanlinlang na political scheme na pinagtakpan bilang isang iresponsableng health program, na pinangunahan ng isang very incompetent na dating Pangulo at isang walang pusong Kalihim ng Kalusugan, kung saan ang domino effect nito ay mas kahila-hilakbot at labis na napaka-bigat sa sambayanang Filipino. Inihayag ni Lopez ang ilang mga numero na maaapektuhan ng controversial na Dengvaxia vaccines at ang mga hindi magandang epekto ng nasabing mga bakuna sa daan-daang libong mga batang Pilipino. Sinabi rin ng DDS blogger na dapat malaman ng mga Pilipino na ang 800,000 mga bata ay walang humpay na binakunahan at kapag inilagay sa isang konserbatibong pagtatantiya 30% ng mga bata ay potensyal na apektado at ito ay nasa 240,000 na tao. Ang mga batang ito ay tiyak na nangangailangan ng agarang medikal na pagsusuri na nagkakahalaga ng P5 hanggang 10 BILLION (conservatively) sa pera, oras, pagsisikap at mga tauhan na kailangan para sa Dengvaxia catastrophe. The Dengvaxia tragedy is not simply about plunder and greed. It is a an insidious political scheme disguised as an irresponsible health program, led by a very incompetent ex-President and a callous ex-Health Secretary, in which its domino effect will be more terrible and overly burdensome to the Filipino people!!! 800,000 children were carelessly inoculated. Let’s put a conservative estimate of 30% who will be potentially affected or may react fatally to the vaccine, which is what Sanofi declared. That would be 240,000 children. Now these children will need immediate medical evaluation. And it will cost our current government MASSIVE amount of money, resources and personnel, not to mention spending so much valuable time and effort of all concerned sectors. 1. If our government needs to attend to the 240k children, they will need between P10,000 to perhaps P100,000 per child! Conservatively at P10k for 240k children, the government needs to spend P2.4BILLION! 2. All government health institutions will be needed to become Dengvaxia Action centers. As it is, these centers are already full and actually hard pressed in coping with various medical services needed by our poor and needy countrymen. 3. Imagine the number of medical personnel like doctors, nurses, aid workers and volunteers will be needed, and will have to be taken away from their regular duties. 4. The government needs to have a massive information campaign to address the Dengvaxia problem. Ergo, taxpayer money will have to be allocated for advertising and information dissemination. ... That P3.5Billion they spent and divided amongst themselves in a blatant corruption scheme in cahoots with the giant pharma company, WILL BE PEANUTS COMPARED TO THE COST OF ADDRESSING THIS VERY SEVERE PROBLEM! In quantifiable terms, we may be looking at somewhere between P5 to 10BILLION (conservatively) in money, time, effort and personnel needed for this Dengvaxia catastrophe. Our government will need to allocate this incredible amount. It is not a programmed activity. It is contingency. The government will have to overreach and overextend to secure funding. It may have to divert funds or raise it by all means necessary, including loaning or seeking aid. And regular health programs will also be affected. Which means less attention and reduced allocation perhaps to our people who have other illnesses or needed medical services. This Dengvaxia scandal has now put in peril our entire vaccination program. There is an erosion in confidence in all vaccines, even the tried and tested ones. And imagine how this will have a bearing on public health as more people can become sick, all because of fear! And Government will be required to again come to the rescue. Which will mean more money, time and effort! Which means more burden for the country and its citizens? But the BIGGEST IMPACT is really UNQUANTIFIABLE! How do you put a value to the EMOTIONAL DISTRESS and MENTAL TORTURE to a PARENT of a child inoculated with Dengvaxia?!!! How do you provide comfort and assurance to someone whose precious loved one is in grave danger?!!! How can you even attempt to explain scientifically or rationally a needlessly potential LOSS OF LIFE?!!! This is what apathy and incompetence brings to us — we become more miserable, and we are so misused and abused! Instead of us progressing and developing as a nation, an insensitive moron like Benigno Aquino III and his equally insensitive and elitist minions, keeps on setting us back, constantly dumbing us down, and always hindering our growth to the point of killing our innocent children! Instead of our current government working towards development and improvement of the country, it has to give focus and attention to CLEANING UP THE MESS and RIGHTING WHAT IS HORRIBLY WRONG! It is why in the last 30 years, our country has been terribly left behind! The criminality of the Dengvaxia mess is beyond horrendous. This is the TRUE CRIME OF HUMANITY! Even the death penalty is not enough for Pnoy and his cohorts! They should all burn in hell 1,000 times over!